Courtesy of USREALTY BROKERAGE SOLUTIONS LLP. 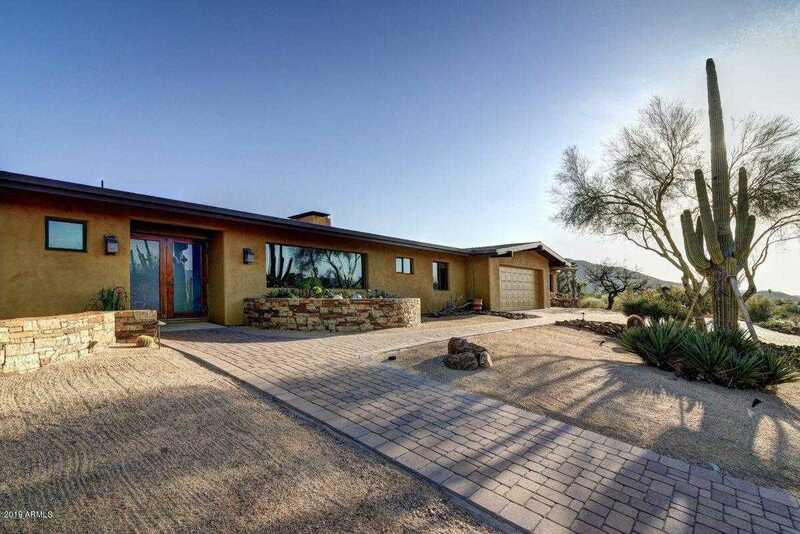 Beautiful home situated on 1.14 acres of pristine desert. Unobstructed views of the Continental mountains and Elephant Butte through the front 12′ picture window. Very private with no adjacent homes yet 5 minutes away from Carefree town center. Completely updated and renovated with premium materials. Main house is 2200sf with a separate (yet under roof) 700sf 2-bedroom guesthouse. Also includes a huge heated/air conditioned 1200sf outbuilding perfect for a workshop, home business, car collector or hobbyist. Last image shows a to scale rendering of the outbuilding with all your toys! Directions: North on Scottsdale Rd / Tom Darlington; Right on Cave Creek Road; Left on Mule Train; Right on Carefree Drive; Left on Mule Train; Lefton Pleasant Place; House on left. Approximate size: 49571.00 sq. ft. Please, send me more information on this property: MLS# 5911588 – $699,000 – 7979 E Pleasant Place, Carefree, AZ 85377. I would like to schedule a showing appointment for this property: MLS# 5911588 – $699,000 – 7979 E Pleasant Place, Carefree, AZ 85377.